This box reveals an enormeous stylistic variety (...). The liner notes are exemplary (...). Once again, one has to admire the richness of music life in Finland. What a beautiful and courageous panorama of chamber music in Finland today. (...) you discover repertoire of great variety, stimulating and on an exceptional level both artistically and in terms of the quality of the works. This six-disc boxed set offers a broad survey of a hundred years of Finnish chamber music, featuring more than sixty performers and twenty composers - between the late Romanticism of Toivo Kuula's Piano Trio (1908) and the postmodernism of Veli-Matti Puumala's String Quartet (1994). Highlights include songs by Aare Merikanto sung by Soile Isokoski, Einojuhani Rautavaara's Rilke song cycle, sung by Marcus Ullman, and Joonas Kokkonen's third string quartet, performed by the Sibelius Quartet. All recordings were made between 1999-2001 live at the famed Kuhmo Chamber Music Festival. 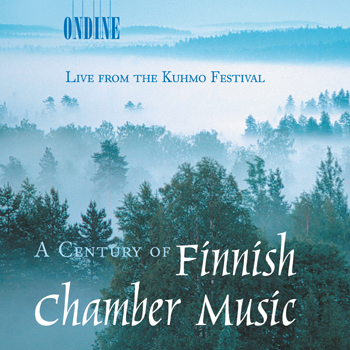 Ondine has maintained a privileged relationship with the Kuhmo Festival, since the label's initial mission from 1985 was to produce one live album at the Festival each season. Its exciting atmosphere since 1970, based on a unique interaction of music and nature, is reflected throughout the musical program, the recordings and the included booklet liner notes and photos.